At Flames fitness our focus is on our members and helping them achieve their life goals through health and wellbeing. We pride ourselves on the results our members achieve. The fact that it was more than just a gym where you go to workout. It has personal training at an affordable price. To maintain an optimal weight, feel energetic and comfortable with my size and to progress into retirement in a fit and healthy state so that I can actually enjoy it. People, who didn’t know me before, look at me now and just assume that I have always been into sport and fitness. But when I look in the mirror, I am almost startled to see the well toned athletic body that I have attained. Until recently I really didn’t know that it was possible for me to be like this. Three years ago I weighed in at 92kg – 20kg over weight for my height. I was 45 years old, I had been overweight for most of my adult life. I had never run, never cycled, never done weights or resistance training, had never even attended a Gym. For most of my life, I had led a sedentary lifestyle. In two years I turned my life around; I found a path from fat to fit. This is my story. up being the BIGGEST step of your life. Tip toe if you must, but take a step. I had a wonderful childhood, growing up on a two acre hobby farm near Griffith NSW. Wages were low and there was never enough money but we had everything we needed and we had two very loving supportive parents. The lack of the latest consumer toys never bothered us our friends would have eagerly exchanged their latest gizmo for the lifestyle we enjoyed. We had lots of animals, chooks, ducks, cats, dogs and horses. There was a dam where we would hunt yabbies, weeping willow trees for shade with long fronds to swing on and make wreaths out of, elephant beetles on the Kurrajongs which we would collect and heard like sheep and I will always remember the joy of a new truck load of sand. We would start civil construction works, making roads up the side of the sandy mountain for our matchbox cars the moment the truck drove away. Although we played outdoors quite allot, playing with bat and ball, running, cycling and other sporting activities were all very uncommon. Physical activity which might have developed strength co-ordination and cardio fitness was never very prominent. My parents were not into sport and didn’t see any value in it. Dad had worked hard all his life and didn’t have any sporting interests, didn’t play sport and had no particular interest in watching it on TV. Mum didn’t think girls needed to be athletic. She had struggled with sport as a youngster and a 2nd grade PE teacher had told her “don’t worry girls shouldn’t be doing sport anyway”. Thirty years later she was still quoting those words and telling us girls “don’t worry, girls don’t need to be good at sport”. So it was neither surprising nor disappointing that when I started primary school, I was the kid chosen last for any sporting team because I had no ball skills or athletic ability. People usually like things they are good at. I was not good at sport, did not like it and only participated when it was compulsory. After leaving high school, my physical activity level dropped from minimal to zero, I discovered Mars bars and developed an addiction to sugar. The chocolate bars didn’t exactly help me work rest and play but they did contribute to a burgeoning waist line. I went for an occasional bushwalk or horse ride (tried endurance horse riding for few years) and discovered gardening when I purchased my first home with husband Dennis. I was definitely not an athlete and had no concept that it was even possible for me to be athletic. If you had asked, I would have told you that I don’t run because I can’t run, never could run, not even when I was young and I won’t join a gym because what’s the point of doing meaningless tasks in a gym – better to be in the garden shovelling mulch. Then I learned that I was wrong. I found out the hard way that working in the gym builds the muscles which support the joints – allowing me to do the things I enjoy without injuring myself. The lesson started in 2011. I was pushing a heavy wheelbarrow around the garden planting some new fruit trees. Later that evening my left knee swelled up to twice the size it should be. It was June long weekend and we had hoards of neighbours, friends and family turning up for our bonfire so I spent as much time as possible elevating and icing the knee in between food preparation. I left the outdoors preparation to Dennis. Everyone pitched in and gave me a hand, so I spent the evening mostly indoors being waited-on. On Tuesday morning the knee was still twice the size it should have been so I booked into my GP. He advised that it could be damage to the knee cartilage but that with time and rest these things can sometimes resolve without surgery – Sometimes, but not this time. I had not felt any pain when the injury occurred but every time I put weight on the leg the knee felt weak and I would feel twinges. The inner side of the knee hurt when I put any pressure on it and I took to putting a pillow underneath to cushion it at night so I could get some sleep. With any kind of physical activity, horse riding or walking the knee would swell up again so I stopped even this level of activity. After nine months I had aches and pains everywhere not just in the knee. My legs felt weak and unstable and it would take time in the morning to feel comfortable just walking. I put on weight. I was fat and I felt old. I was 45 but felt like I was 65. It was not getting any better so I went back to the GP and got a referral to a knee surgeon. The injury was a simple tear of the medial meniscus. Surgery was done in June 2012 with keyhole incisions and I was home that night with referrals to get physiotherapy for rehab. I was surprised how easy the surgery was and there was almost no pain. When I visited the physiotherapist for the first rehab session, I was determined to do everything possible to get back on my feet. Twelve months of being an invalid had given me a glimpse of where I was headed if I did nothing to improve my physical fitness and the first step was to get back on my feet and start walking. Even I was shocked at how unfit I had become. The physio put me onto an exercise bike, no additional resistance it was just about getting the knee mobile. He asked me to pedal at about 60rpm for 5 minutes. I was really out of breath and struggled to keep up even that small effort for the full 5 minutes. He showed me some leg lifts and wall ball squats to build up the leg muscles which would stabilise the knee then told me to do these as often as possible. I did the prescribed exercises four times every day. This is where having a work place gym really helped. I did the exercises in the morning before leaving home, again at morning and afternoon tea and then again when I got home. They took about 15minutes for each session. Peddling on the exercise bike for 5minutes, four times a day started to get tedious, so I began setting new goals, like trying to increase the RPM until I could keep going at 80rpm for 5minutes, then I increased the resistance and started working back up to 80rpm, then I increased the duration to 10 minutes. Little challenges, short term targets, easily achieved, but each little goal reached marked an improvement in my strength and fitness. Every two weeks I would visit the physiotherapist and he reviewed and modified the exercise program. After eight weeks I felt much stronger, my cardio fitness and leg muscle had noticeably improved. At the end of this session the physiotherapist told me, “OK you’re done, I don’t need to see you again”. I got home and that evening I looked at myself in the mirror (20kg overweight), I remembered his words “OK you’re done”. Again I looked in the mirror and said to myself “NO – you’re not done yet”. It was one of those pivotal moments. I had made a decision which would radically change my life, take me down a different path. It was time to get fit and loose the fat. I had motivation now. This motivation carried me through to achieve far more than I had ever believed possible. Don’t start a diet with an expiration date. Focus on a lifestyle that will last forever. As a kid much of our play equipment was built by Dad. We didn’t have much money but he was a handyman who could make or fix just about everything. He was a Jackeroo who had made the transition from Clydesdale teams to the first tractors and mechanical harvesters. He was a blacksmith carpenter and mechanic, whatever was needed. He never employed tradesmen, why pay someone to do something he would do better himself? I am sure that in Dad’s eyes, big was better. We had the biggest swings, the biggest sea-saw and the biggest slippery dip (even bigger than in the town parks). It probably didn’t seem so massive to 6’4” Dad, but to us kids it was terrifying. Bravely we tackled and came to terms with the enormous play equipment and when our little friends came around we would lead them to the top of the giant slippery slide and show the way. Along with the big theme, our netball hoop was so high that I could barely throw that far when standing directly underneath it. Dad said keep trying if you can get good at this height you will be unbeatable on the standard height rings when you start school. Back then netball was the sport of choice for primary aged girls in small western NSW schools. I tried to get the ball through that super high netball hoop in preparation for my primary school debut. This was way beyond my abilities, I tried and failed and failed again and again and eventually gave up. When I started school I fumbled badly attempting to shoot the standard height hoop and was quickly relegated to the other end of the field as goal defence. Just as quickly I lost interest in being a netball player. The moral to this story: set a progression of small, easily attainable little goals to generate the momentum and reward of success. Big aspirational goals are great and if used well can give direction and motivation, but they should never replace a progression of smaller more easily achieved goals. So it was time to start setting some goals that I could achieve. I just wanted to get back to where I was before the injury. Initially I wanted to lose 12kg over 9 months and then maintain that weight or continue with a slow downward trend for the next 9 months. I planned to do this through exercise and healthy eating choices. I have never been on a diet and don’t believe that quick fix diets have a long term benefit because they don’t replace bad habits with good habits (The chains of habit are too weak to be felt until they are too strong to be broken” Samuel Johnson) – at the end of “the diet” people always return to old habits because the chains have not been broken. Hence I chose to set a long term goal which would initiate and consolidate a lifestyle change. I also set short term goals: lose 2kg per month for the first three months, then 1 kg per month for the next six months. Changes to diet included cutting out as much refined sugar as possible, moderating the carbohydrates and eating lots of fresh fruit and vegetables. I never calorie counted or starved myself, just made sure that there were healthy options available if I felt like a snack. The exercise program started with the physio-prescribed leg exercises with increasing resistance and duration, and I added some core strength exercises which also gradually increased in resistance and duration. Building strength in the core, back, legs and shoulders was the priority, because this was the foundation which would prevent future injury. I had just recovered from one injury and did not want to go through that again if it could be avoided. There were no sudden changes just a positive progression from easy to hard, light to heavy, short to long. I have seen too many people set themselves up for a cycle of injury and rehab by not having the patience to build the foundations first. About three months into the self-prescribed program I found a magazine article which I found very educational. There were no radical new ideas here, just tried and tested methods, well-written, easy to understand concepts on how lose weight by building muscle mass and improving metabolic rates. It explained the benefits of combining resistance training with cardio and what was targeted by doing different numbers of reps. From this I designed a workout which started with 15 minutes of moderate Cardio (Exercise Bike) to warm up, 5 minutes of high intensity cardio often using intervals (Rowing machine) then free-weight exercises (2x 10 to 15reps) targeting each of the major muscle groups, then core strength exercises. The weight started to fall away and in a few months I was beginning to see the first bulge of muscles where previously there had been none. By January I was feeling great. It was six months since the knee operation; I had already lost 12kg (way ahead of schedule) and was setting new goals. I decided to try going for a short jog during one of my lunchtime walks. For the first time in my life running felt effortless. My breathing was light and easy and I felt like I had springs in my feet. Time spent in the gym building cardio fitness and strengthening the leg and core muscles was paying dividends, and opening up new possibilities. I never knew that I could run, or that running could be so easy. Then I started to set targets (cadence speed and distance) and started to measure these things (with the aid of a Garmin sports watch). Running now wasn’t effortless, but it was very rewarding because each week I started to see measurable gains. I downloaded from the Garmin Connect website, an exercise program for first time runners wanting to run 5km and followed this program (almost) to the letter. My first goal was to simply run the 5km Darren Wall fun run without having to stop and walk. I quickly changed that goal to running at > 10km/hr. In May 2013 I completed that run at 10.9km/hr. Another goal achieved and exceeded. In March 2013 I purchased my first bicycle and with encouragement and coaching from a cyclist colleague started riding to work 2 days per week (about 30km each day). I would drive into Canberra and meet Joe at a car park near the Lake and we would ride to work from there. Having a riding companion when starting out was hugely beneficial. Joe showed the way along cycle and recreational paths (away from the fast noisy traffic) and chatted about cycling safety and etiquette. The early morning rides around Lake Burley Griffin in the heart of Canberra with icons like Parliament House and the National Library reflecting on the still surface of the lake, made for an idyllic start to a work day. My confidence on the bike improved and I started riding to work on my own when Joe was not able to join me. I still don’t like riding on the roads but Canberra has an excellent network of cycle paths so I started to park a bit closer to home and ride a bit further to work. Added to this I was running 3 days per week and gym 3 days per week. I was now making a serious commitment to fitness and having lots of fun doing it. About 1 year after starting my fitness campaign I went on a 4WD holiday to the tip of Cape York with husband Dennis and some neighbours. I had lost around 17kg and had achieved and exceeded all my weight loss and fitness goals and for the first time since my teens I felt good about wearing a swimsuit. It was also the first time in a year that I had a 3 week break from regular training but at every opportunity I went for a run along the beaches. I loved the beach runs because they felt so free and effortless. No goals, no targets, no pressure to perform, just a sandy beach with palm trees blue ocean, slapping waves, salty wind in my hair….It felt like a reward for all the hard work put into getting fit. It was on one of these runs that I decided to set new goals and find new inspiration to keep moving in the right direction when I got back home. At this stage I still was not sure where my new passion for fitness would take me but I was enjoying the running so I set the Canberra Times 10km Fun Run as my next challenge. I also decided to try joining a commercial gym to see what they had to offer. Morethan 20 years earlier I had attempted to join a gym – it had felt like I was entering a foreign country where no-one spoke my language. I went about 3 times, there were no trainers to be found, so I asked the very helpful muscle men hanging around the weights benches to interpret the exercises on my card. After three visits I was still struggling with the terminology, probably asking the same friendly muscle men the same stupid questions and I gave up. So, 20 years later when I decided to try joining a gym again, I chose Flames Fitness because they advertised a trainer working with you every time you train. I was already more comfortable in a gym than I had been 20 years ago, the internet had been a great source of information and a nice quiet, well equipped workplace gym had given me a good start. I still had plenty to learn and the 20 weeks I spent working with the trainers at Flames was an excellent investment in time and money. The exercise program was remarkably similar to my own program so it felt familiar, but the trainers corrected my technique on some exercises and made sure that I was engaging the right muscles. The way they used the cardio equipment was much more varied than my home grown program, I saw how they filled out the record card to track my progress and picked up on little things that I had been missing in my own program. At the end of the 20 weeks I felt confident working out in a gym. No more feeling like a foreigner. Flames fitness has an excellent and very friendly boxing program. A friend had mentioned that boxers were “crazy fit” people and I had read that boxing was great for fitness. So, a few weeks after joining Flames, I turned up to my first boxing class. My friend was right – you do need to be crazy fit to be a boxer and for everyone else, boxing is a fabulously fun way to get fit. It started to add a plyometric element to my strength and cardio fitness program. I quickly learned the difference between boxing and box fit. At a Flames boxing class you do get fit but you are also learning real boxing skills. If fitness is all you want from boxing then that’s fine, at Flames there was never any pressure to fight. There are a range of options to choose from: one class is mostly pad-work, focusing on fitness and skill, another is the contact class (for the slightly more adventurous) and before class there are sparring sessions. I started with just the fitness and pad work. This was the first time I had ever pulled on a pair of boxing gloves and I had never thrown a punch, didn’t even know the difference between a straight punch, a hook and an uppercut, so they had to start by teaching me the most basic boxing skills. Head coach Quinten was away at the time so the class was being lead by Fleur (Fleur was the only other women in the room and I was really glad she was there). We started with skipping; I had not held a skipping rope since primary school so when Fleur asked if I could skip I had to say “I don’t know”. It was awkward but Fleur gave me a few tips and over the next week I practiced skipping in the gym at work until I started to get it. Next was “The Walk”. A lot of newbies struggle with this one and I was no exception. It is a technique of moving forward in the boxing stance while slipping punches and it’s quite a natural movement once you start to get it but at first the co-ordination can be quite challenging. Once we got into the skills part of the class Uy volunteered to be my partner for the night and while Fleur was busy with the rest of the class he patiently lead me through the basics. Uy and Fleur were both very encouraging and the people in the class were all very welcoming. I felt very awkward and uncoordinated but I enjoyed learning the new movements and I had lots of fun slamming punches into the pads. Monday night pad-work boxing classes soon became the highlight of my week. After a few weeks I decided to get a bit more adventurous and try a contact class. I didn’t know if I could take a punch but I have taken plenty of big spills off my horses and bravely dusted myself off and hopped back on. It couldn’t be any worse than that… could it?? I soon found that getting punched wasn’t the problem (the punches are kept fairly light, especially for beginners). The most confronting thing was that I actually had to punch someone. I had never hit anyone before, I had never been in a fight (not even a girly cat fight in high school) so when I was told to throw a body punch I tentatively tapped my gloved fist into my partner’s stomach. “No… Punch me,” he said holding his arms up and presenting an unguarded stomach. I tried again but couldn’t put any power behind it. “You won’t hurt me, can’t hurt me, so put some effort behind it and punch me as hard as you can” he said. After several failed attempts he turned to coach Quinten and said she won’t punch me. Quinten laughed at me and said “go on punch him”. I tried, it took many more attempts but eventually I got up the confidence to throw something that was almost like a punch. I have since been partnered with other new starters and quietly laugh as I see some of them going through the same dilemma. By the end of my first contact class I was buzzing with excitement. I was beginning to understand why people might actually want to get into a boxing ring and fight. I loved boxing for the combination of skill, speed, fitness, strength, co-ordination and strategy. The contact class began to give it all some purpose. At this stage I was still boxing to get fitter and stronger to support my running ambitions and by September 2013 I was ready for my first 10km fun run. I had set a target of 10km/hr but was by no means confident of achieving that target. Once again I had been following a Garmin training schedule, but this time I had been fitting the running in around boxing classes so was not following the program exactly. I was also experiencing problems with the IT-band and hamstrings (a very common runner’s injury). I hate failure. I worried that the legs would cramp up. I worried that I would go out too hard and not be able to finish the run. I worried that I would be too slow and not achieve my target. As the day drew close I felt the tension rising. The evening before the run I just wanted the run to be over already. I was at a dinner with neighbours. I ate lightly and held back on the red wine. The run became a topic of conversation and I was treated to tales of runs my friends had done. One neighbour had done this run in previous years. She ran regularly, without setting targets for speed or distance, just for the fitness benefits and because she enjoyed running. Her advice was to just get out there and enjoy it. Her brother had run several half marathons and then attempted a full marathon. He had found the half marathons quite easy, so he didn’t taper off, actually did a 30km run the week before. When he started the marathon he was still feeling the effects of the training run and struggled to complete even the first 20km, a distance he had previously covered with ease. He was devastated when he had to pull out before half distance due to injury. If I failed to go the distance then I would not be the first runner to pull up short. I was starting this run with an injury, but no excuses, first I had to give it my best effort. Another couple who were in the army had run a full Marathon while serving in Afganastan. The race had been organised on the army base to coincide with the Boston Marathon and they told tales of running though a sand storm which rolled in halfway through the race, but they kept going and finished the marathon in less than 4 hours. Wow, and I was worrying about my little 10km run? Sometimes listening to other people telling tales of their own experiences can be the best tonic for pre-race nerves. The next day I lined up for my 10km “fun” run, went out too hard but kept going hard anyway. I remember about 8km into the run I was near the start of Kings Avenue bridge and I could hear the announcer at the finish line (sound carries well over water) I could see the crowds along the far shores of Lake Burley Griffin. I felt like I had nothing left but I kept pushing hard, I was nearly there, I could hear the finish line. I was overtaking people now, lots of them. I couldn’t see how far along to the finish line but I kept running hard. The loud speaker didn’t seem to be getting any closer. That last 2 km seemed to be a marathon in itself. Finally we turned up into the roped off finishing lane, only 200m to go now. I heard a woman behind me say to her friend “time to sprint now?” her friend replied “yes” so I sprinted too. I thought “no you’re not going to overtake me now”. I felt giddy, light headed – wondered if I might faint if I kept up this pace…. no….. still feeling good…. actually feeling no pain now….. keep going. I sprinted over the finish line overtaking a dozen other runners in the process. They didn’t pass me. I finished that 10km run in 52minutes and 58 seconds (11.3km/hr). Another target smashed. For a while I had ideas of trying a half marathon and maybe one day a full marathon, but for the time being the issues with the IT Band and hamstrings needed attention. I had been in pain for most of 2013 and it was starting to wear me down. So I took a short break from running to rehabilitate. I tried physio and massage, stretching and light exercise and nothing seemed to relieve the pain. I hate needles and had to this point avoided acupuncture as a therapy but during a physio session earlier in the year they had used a dry needling technique on the IT band and this was the only thing which had given any relief. Dry needling is a bit like acupuncture but less targeted. By now I was willing to try anything (did not want to lose that hard earned fitness with a long recuperation) so I booked in for my first acupuncture session. It took two sessions to find the source of the problem, partly because the problem was the inner hamstring and the acupuncturist had to work close to areas where decent therapists don’t go. He apologised as he followed the tight muscle and as soon as he found the spot where it was knotted I knew and he knew that he had found the problem. My physio had been too embarrassed to go there, and had found other tight knotted muscles which he worked on but could not pinpoint wether the source of the discomfort was the hamstrings or the glutes (both were tight and sore). After two acupuncture/massage sessions the pain began to subside and after a few weeks I was for the first time in six months completely pain free. I have returned many times since then for acupuncture, it doesn’t cure everything and there is still a need for physiotherapy for injuries like sprains and strains but when the muscles and ligaments go into tight spasms acupuncture seems to be the only thing I have found which releases them. After completing my first 20 week membership at Flames fitness I decided to continue with the boxing classes but I also wanted to try cross fit. A colleague at work who was part of a Dragon boat team had mentioned that the strongest fittest member of his team was a woman who did cross fit. This piqued my interest so I started to do my research. Cross fit is a combination of strength and conditioning exercises which include weight lifting and gymnastic movements. It has a reputation for extreme fitness but also for having a high injury rate so I approached this venture with some caution. I bought some trial memberships with various cross-fit gyms around town. I found that there were big differences in the way cross fit was coached at the different gyms. Same exercises and equipment but the workouts were different and some Gyms were better at teaching good technique and the instructors are more actively engaged with the class. I chose a Gym which had a good instructor to participant ratio, where the focus was on technique not how heavy you can lift. The potential for injury in cross-fit is influenced by the quality of the coaching but also by your own attitude to the sport. It is important to not be influenced by the weights that other people are lifting. Remember that the only person you are competing against is yourself, the transition to lifting heavy weights will come later as you develop strength, skill and correct technique. Learning good lifting technique (a combination of correct position, sequence of movement and recruiting the right muscles) is a great life-skill which has so many applications in everyday life: everything from lifting boxes and moving furniture to loading firewood and pushing heavy wheelbarrows around the garden. Some of the exercises have been particularly good for teaching muscle recruitment and engagement. A sedentary lifestyle and poor posture often leads to poor use of some muscle groups and training neurone pathways to recruit these muscles needs to be part of any conditioning program. The gymnastic elements of cross-fit have been hugely beneficial for me. The kipping movement on the pull-up bar has helped me to use and develop the muscles in my shoulders. Rebound box jumps and double under skipping have taught me to use the eccentric phase of muscle contraction to generate spring in my jumps. Somebody with a sporting background might already be able to do this naturally, but for me with no prior athletic back-ground, building the muscles was just the first step, then I needed to learn how to actively use them. I would probably have struggled with cross-fit when I was just starting out and a program like the one at Flames using free weights in set rep ranges, methodically working each muscle group no doubt was a far safer way for a newbie to establish the foundation. But with a foundation of core strength and cardio fitness established, I was starting to focus more on good movement and muscle recruitment. Cross-fit and boxing have both helped. Boxing is a great all round workout, the emphasis leaning toward cardio fitness, speed, agility, balance and co-ordination where cross fit has greater emphasis on strength and power. I find they are complimentary. Diversity of the cross-fit exercises ensure that I am always learning something new and I love the supportive social aspect of a cross-fit class. Don’t compare your Chapter 1 to someone else’s Chapter 20. Everyone’s journey is different. Just do you. After a few months when I arrived early for a boxing class Quinten asked if I would like to try sparring. Yes I wanted to have a go! I had been watching the other more experienced boxers sparring each week and had been hoping that I would eventually be called up for the challenge. As I stepped over the ring ropes into the ring I realised this was my first time inside the ring. It was a strange feeling. It reminded me of the first time I had ridden through the tunnel under the Phillip Island race track and into pit lane where motorcycling royalty like Doohan and Gardner had plied their trade. I had enrolled in a performance riding course, largely because I wanted to experience Phillip Island race track from the rider’s perspective. Actually being there and riding out onto the tarmac was more awesome than I had ever imagined. Standing there in the middle of the big empty boxing ring inspired memories of that moment. I wasn’t scared (I trusted Quinten would be nice to me) but I was tentative: what to do, where to move, what to expect? It was a bit like getting into the driver’s seat of a real car for the first time after spending a few months learning how to drive with a simulator. The bell went and Quinten was moving towards me. What now? Oh yeah touch gloves, good start…..and next? Quinten was there in front of me waiting. OK I’ll throw a jab maybe a left right. He was still in front of me within range, another left right. What next? Move away; Quinten followed me. Another left right – too predictable, I needed to try something different. Where were the hooks, uppercuts and what were those combinations we had been practising in class? Another left right. My mind was blank. I needed to learn how to throw these punch combinations without thinking. Another left right. “You’re too predictable,” says Quinten. “Try something different” I nod and think “Yeah I know, I’m trying”. Another left right. Bell goes off – first round finished. Fortunately Quinten was kind to me. He is not into damaging or intimidating his students. I was buzzing with adrenaline. I felt like I had failed, but like the motivational quote says, “Failing is only failure if you quit”. I had no intention of quitting. I knew I could do better, I wanted to do better, I wanted more. The contact class was exciting – sparring took it to a whole new level. I had never experienced anything quite so physically and mentally demanding. I started drilling different punches and combinations on the heavy bag at home and I continued training twice weekly at the gym. Then I found an app for my phone which called out punch combinations. So I started punching by numbers on the heavy bag at home. This worked really well and I started to become more comfortable using the different punches in improvised combinations. I turned up for every class, always early, always ready to jump in the ring with Quinten for a few rounds of sparring to try out the things I had been practising. I soon found that trying to hit a target that blocks, moves, parries slips and throws punches back at me was more difficult than I had ever imagined and none of the moves and combos I had practiced at home seemed to work for me. The addiction to boxing was now complete. I spent every possible moment trying out drills even in front of the bathroom mirror at work (when no one was looking). As Quinten stepped up the pressure in the ring, I soon found myself out of breath gasping and getting to the last round barely able to lift my arm much less throw a punch (and I had thought that I was fit). The final round often ended with Quinten throwing a barrage of light punches at me which would only stop when I started to punch back. This spurred me into greater efforts to improve my cardio fitness, strength, punching technique and endurance. Now I was running to get fitter for my boxing, not boxing to get fitter for my running. Boxing, running, cycling, gym – as often as my body could cope with it. Everything was focused on making it to the end of the third round. In June 2014 I started going to the Saturday sparring sessions because two lessons per week were not enough. I wanted to do more boxing. After a couple of weeks Quinten asked if I was interested in fighting. I had already thought about this. Earlier in the year I had gone to watch the ACT Amateur Championship Boxing matches. Several guys from our gym were fighting so I went along with the Flames team to cheer them on. This was the first live boxing match I had been to. During one of the intervals between fights James asked me “so do you want to do this?”. He nodded his head toward the ring, “Do you want to get up there and fight?” I hesitated for a moment. Fights were much more intense than sparing sessions back at the gym. Then I replied, “I think if I don’t try it I will regret not doing it”. So when Quinten asked me if I wanted to fight I already knew what my answer would be. I had a new goal. I started doing weekly one-on-one boxing lessons with Quinten. I was now training or sparring in the boxing gym four times per week, training at home one day per week throwing a few punches at the floor-ceiling-bag on my way to the car as I left for work each day and at the mirror a dozen times a day, even dreaming about slipping and throwing punches in my sleep. Quinten gradually started to increase the pressure when he sparred with me. I was never in any doubt that Quinten controlled everything that happened in his boxing ring. I could land a punch on him only because he let me. When he wanted to have some fun he would drop his guard and slip, duck and side step every punch I threw at him. I would find myself running around the ring chasing him and every punch I threw would find nothing but fresh air. Far from getting frustrated, I loved seeing this demonstration of skill. So when my punches were landing I knew it was only because he was letting them land. He kept the punches he threw back at me light and didn’t throw too many punches, but I knew he could land those punches anywhere any time any way he chose. So as Quinten increased the pressure and started throwing more punches back at me, started being a little bit more difficult to hit, and started putting a little bit more weight behind the punches, I took that as affirmation that my skills were improving even though the sparring sessions were perhaps getting more frustrating. Recovery is an important part of any training schedule and one which I have often overlooked. I remember after one sparring session Quinten saying “well done” and my reply “no it wasn’t, that was bad, really bad”. It was bad. We had just completed several rounds sparring but from the start I had been unable to throw a decent punch, could hardly lift my arm much less put speed and power behind the punch and my legs had felt leaden. It was at the end of a hard one hour lesson with hand weights and I had started the session already stiff and sore in the arms and shoulders from my gym session the previous day. No point getting frustrated, do something about it. My first response was to work harder, so for the next few weeks I drilled jabs on the heavy bag (with hand weights). It may have helped build some strength and endurance, but I was slow, my muscles were perpetually sore and my movements were awkward. I had reached a point where I was not recovering sufficiently between sessions. Fatigue and muscle soreness were accumulating and it was difficult to train effectively. I needed to think about the way I trained to allow recovery so that I could get the best value out of each training session. I remembered a quote from an elite athlete “Finding time to train is not a problem, the problem is that there are never enough hours in the day for recovery, so that I can train effectively”. Far too often, I have failed to train effectively because I am still sore from the previous training session. I know this compromises my performance and limits the benefit from the next session. I set about prioritising my training sessions, the ones where I need to be able to deliver peak performance and tried to schedule less intense exercise the day before to enable recovery. I have also attempted to redistribute the weekly workload to allow a progression between different types of training efforts so whilst I am not fully recovered from the previous training session the next session has a different focus. I am always stiff/sore/tired in some way, sometimes more, sometimes less and sometimes I reach the point where I really do need to rest and will schedule an extra day off or reduce the work load for a week. Recovery is important too. I love experimenting with my training schedule in an attempt to optimise the results and I have seen some huge improvements but despite my best efforts to train smarter I am starting to think it may be time to go back to the experts to see if they can help with optimising the cycle of work and recovery. So what does husband Dennis think of me boxing? So long as I don’t punch him it’s all good. He is not a fighter and neither of us would ever resort to violence to settle our disputes (probably why we are still married after 25 years). He has at times felt a bit neglected, I do spend allot of time in the Gym. Not having a meal cooked for him and on the table by 6pm was at first a big issue for him. He has had to make some adjustments and we have worked around the problems together. I always make sure there is food pre-cooked so he can easily get a meal when I am not there to prepare it. Maintaining the relationship with quality time spent together is also really important, so I do try to ensure the time we have together is quality time. Evenings spent in front of the TV or at the computer are not quality time together and it is OK for me to spend that time in the Gym. When I do get home we spend some time together talking (not watching TV) and we often sit down and have a chat over a cup of brewed coffee (Dennis makes a great coffee in his stove top percolator). He is not concerned with me getting hurt. Boxing is so much safer than horse riding. Particularly endurance horse riding where I rode out alone training in all weather conditions and at odd times day and night on fit highly strung steeds souped up on high energy feeds. I have had some enormous spills off my horses, smashed two riding helmets with associated concussions, nerve damage to my back and shoulders, broken fingers, even came to terms with my mortality kneeling on the side of a bush track when close to passing out and unable to take a breath. I am surprised in comparison, how few injuries occur in boxing. In two years of boxing, I have had one blood nose, a sprained ankle, a sprained thumb, and a slightly bruised lip on a few occasions. These are all fairly mild injuries compared to my spills off the horses and could just as easily occur in team sports like basketball, field hockey or football. When I told Dennis about the blood nose all he wanted was to see the photographs. I told him there were no photos, so he said “no evidence to support your claim – it didn’t happen. Tell Quinten he has to punch you in the nose again and make sure you take some photos this time”. We had a good laugh about it. He loves that his overweight middle aged wife has transformed into his very own “hottie” and he understands that boxing motivates me to keep up the effort to remain fit. Not that he ever criticised me for being overweight. Body image had never been high on our agenda’s and we had both been overweight for a long time. About a year after I embarked on my fitness lifestyle he decided to have a go at losing some weight and getting a bit fitter and stronger. His initial goal was to get fit in preparation for a ride through the deserts of Western Australia on his 950KTM dirt touring bike but he also saw the long term benefits of being fit and strong so that he could continue to enjoy riding dirt bikes well into his retirement. He loves the big rides through the desert in remote areas and on this particular trip was planning an 8000km ride in 3 weeks covering lots of remote desert tracks. I do worry about him when he sets out on these big trips, but I understand his need for adventure, just as he understands my need to test my mettle with the horses and in the boxing ring. When Dennis embarked on his own journey toward a fitter healthier lifestyle he more or less followed a similar pathway to weight loss and fitness as I had. To his credit Dennis set his own goals and stuck to them. He moderated his diet, paying a bit more attention to the types of food he was eating and started doing the preliminary work with exercises to strengthen his core. He did regular sessions on the exercise bike, worked through the positive progression from easy to hard, light to heavy, short to long and started walking and cycling. We started cycling around the lake on the weekends together, but it wasn’t long before he was too fast for me and I was holding him back. After that we started out on the ride together but he would soon leave me behind and do an extra 10km loop. We always met up for coffee at the Carillion before riding back to the car together. For Christmas (3 months after he had embarked on the fitness path) he asked for some personal trainer sessions with a trainer recommended to him by a mate. This trainer had come from a blue collar background and had himself made the transition from obese to fabulously fit and was someone Dennis could relate to. Dennis agrees that the prep work done prior to starting with a PT was what enabled him to cope with the more intense workouts. The PT program was hard, Dennis’s muscles were sore and aching every day but the reward was measured by a shinking waistline, bulging biceps and faster times on the regular push bike ride around the lake. By the time he was ready to leave on the big bike trip Dennis had lost 12kg, most of the potbelly was gone and he had developed nice muscle tone in the arms and shoulders (I thought he looked really hot in a singlet and made sure I told him so). Being fit and healthy is in itself very rewarding but not always easy. It doesn’t matter what it is that motivates. When you are tired and the muscles are sore and life gets busy, it is important to have something to keep you going, keep working. For Dennis it is the motorbikes, for me it is the boxing. I have now been preparing for my first fight for more than a year. I am ready to step up and fight. The prospect of a fight is what motivates me to keep up the intensity of training for skill and fitness. It also motivates me to keep close to my fighting weight. There is just one problem. There are not many women taking up boxing for the first time at the age of 47. In boxing an opponent must be matched for age, weight and experience. Boxing is a great sport for women, excellent for strength, fitness, physique and co-ordination. It’s easy to put in a solid workout when you are having fun and boxing is lots of fun. More women are entering boxing Gyms and discovering these benefits, but there is a big difference between box fit and a genuine boxing class and allot of Gyms are only doing box fit . Those who search for (or have the good fortune to just stumble upon) a genuine boxing gym, will have the opportunity learn real boxing skills while enjoying all the other benefits of boxing. Not everyone will want to go on and fight but some will. Women’s boxing has become more mainstream since its inclusion in the summer Olympics. In Ireland and the UK interest in women’s boxing has boomed, heralded by the very popular and successful Olympic medallist Katie Taylor. Perhaps the success of Shelly Watts in the 2014 Commonwealth games will generate a similar peak of interest here in Australia. With increasing popularity of women’s boxing, it would be nice to think that in the future there will be a much larger pool of potential opponents. But right now, there are very few women of my age group who are boxing and finding a suitable opponent is very difficult. It is proving difficult for coach Quinten to find sparring partners for me, much less a suitably matched opponent for a fight. I had wanted to go to the masters tournament in Adelaide last year but my coach wasn’t available that weekend and as it turned out there were no fights in my weight division anyway. 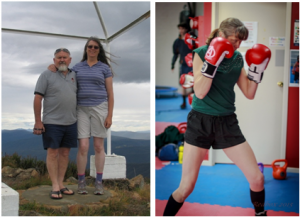 I have since dropped another 4 kgs to put myself within range of two weight divisions and look like getting my first fight at the 2015 Masters games in Adelaide. I am mindful of the proverb “be careful what you wish for” but I also know that if I don’t get the opportunity to test myself in the boxing ring, that I will always regret not doing it. For me, the journey “From fat to fighting fit” has opened up so many new possibilities, far beyond the physical transformation which is where it all began. I have made new friends, learned new skills and discovered an exciting new sport in boxing. But it goes far beyond this too. It is the recognition that “time spent building core strengths could pay dividends, and open up new possibilities”. I now begin to recognise that there are many things I have been telling myself “I can’t, I won’t, I never could”. But perhaps I can. If I have the motivation, put in the effort, set a progression of realistic goals, take the time to build core skills/strengths. Perhaps I can. I had genuinely believed that I can’t run, but now find that I can. I even have a plaque hanging over my desk at work. It says “1st Place Female runner Daren Wall Fun Run 2014”. Twelve months after my first 5km fun run I returned to the same event and took out 1st place. My initial goal in 2013 had been to simply cover the distance without having to walk. I still look at that plaque with an element of disbelief and realisation of what can be achieved with the right motivation, patience and commitment. Can’t has become “Can if I am willing to put in the time and effort”. How much do I want it? Where is the motivation? I can – if it really is important to me then I can! After dealing with a stressful situation at work, I turned to comfort food and put on about 10kg*. Also, with Christmas, holidays, summer etc. I just kept on going and forgot to reverse back to my good eating habits. I found the detox program very effective as it put me back on track to eating a healthy diet. I lost weight and feel more comfortable in myself and in my clothes! The training program with Flames complemented the detox as one is not effective without the other. The trainers ask me what my goals are and what I want to achieve. They consider my injuries when designing a program and design it around exercise that I enjoy. Yes, twice in the past 2 years. I initially lost 16kg* then put on and have now lost again. With tailored exercises to strengthen my knee and my lower back, I feel that they are both a lot stronger than when I first started with Flames. I a pretty toned for a 51 year old and still managed to get into a bikini last summer without embarrassing myself or my family. Mentally, I have remained committed to my training regime and now it is just part of what I do. I would never consider not exercising after seeing the importance of it. I know that I am giving myself the best chance of living a long and healthy life. Absolutely. It is not as difficult as I thought it would be. The hardest part is the first 3 days and that goes by pretty quickly. The next 7 days is strict but I found that I was eating plenty of food and sometimes couldn’t eat everything I was supposed to. The following 14 days is just simple, clean eating which is what we should be maintaining most of the time. I have learnt that it is ok to have treats once a week but to substitute the unhealthy treats for the healthy treats. I have picked up a lot of great recipes and have susbstituted much of my pantry for healthier options. It has set me up for life! Any coach will do well if they are given a naturally talented balanced co-ordinated intuitive athlete to work with, but a great coach can inspire and bring out the best in anyone.I am not a natural athlete.When I joined Flames Fitness, I had started to lose some weight, gained some fitness and I had a great work ethic, but I was completely uncoordinated and still moved poorly.I was slow, had no plyometric strength and walked with a waddling gait, like you might expect from someone who has been overweight and led a sedentary life.Quinten has had patience and skill to work with a completely uncoordinated non-athlete.He has inspired and coached me to achieve far more than I would ever have imagined possible.I am now the Australian title holder in my age and weight division and I am not the first Flames boxer to attain an Australian title.Flames fitness is all about assisting people who want to make a change but need a little bit of assistance.Not everyone will want to take it to an elite level, that takes allot of work, but everyone can enjoy the benefits of being a little bit fitter.You set your goals and the team at Flames will help you to get there – and maybe even inspire you to reach a little bit further – to achieve more than you might have thought possible when you started. I am writing to say that I have been blown away with the service, professionalism, programs, attitude that I have received from your gym and trainers. I have used all sorts of gyms before from fighting gyms, mainstream gyms, one on one (very expensive) personal training and the level of service and attention I received from flames fitness Phillip far surpassed them all. Not only is the service great I have real results! I am able to do things now I never thought I could do. I am amazed at how much my strength has improved. Although I have had a positive experience with the whole team I have to give a special thanks to your trainers Erik and John. They really pushed me to do everything I could and the results I have show this. You can tell they truly have a passion for their work. For the price I paid for the program I felt I was taking advantage of your trainers as I spent a lot of time with them, asked them a lot of questions and received a very high level of service. I would have happily paid more for my program. I also really enjoyed the programs Erik wrote for me, he really listened to what I asked for on day one. He was able to alter them as required. I also enjoyed abusing him on freelance days when he decided to up the intensity. I have been training with an end goal, I am off to start working for the Australian Army on the 25th of June. I am sad that i wont be able to continue my training at Flames. But thanks to your trainers I am confident that I will be able to make it through my basic training and continue to accomplish my fitness goals. I will and have been recommending Flames Fitness to everyone. *I Love Flames fitness. The trainers (especially Erik and John) have been brilliant. There’s not many other things that would make me get out of bed at 0430! I am definitely fitter and stronger. I am also sleeping better.